The maxon motor EPOS2 is a small-sized full digital smart motion controller. 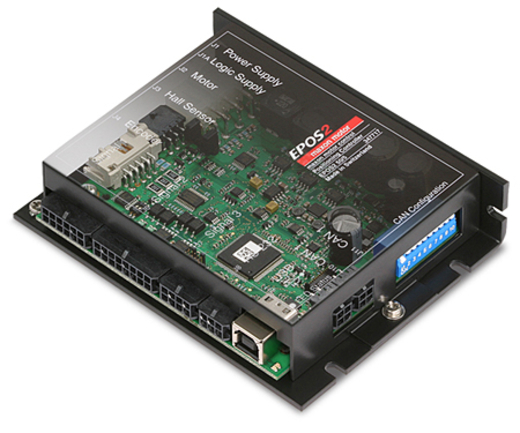 Due to the flexible and high efficient power stage the EPOS2 drives brushed DC motors with digital encoder as well as brushless EC motors with digital Hall sensors and encoder. The sinusoidal current commutation by space vector control offers to drive brushless EC motors with minimal torque ripple and low noise. The integrated position-, velocity- and current control functionality allows sophisticated positioning applications. It is specially designed being commanded and controlled as a slave node in the CANopen network. In addition the unit can be operated through any USB or EIA-232 (RS-232) communication port.